I think I forgot to mention that we had a substitute for our first class and I'm glad our regular instructor is back. She is much more helpful and doesn't try to do everything for us if we mess up. We were actually a few mins late so by the time we had gotten there everyone had already picked out their paperweights they made last week so we were stuck with the leftovers. I guess it doesn't matter too much I don't remember which ones I made anyway but I don't really think we made the ones that were left. Oh well. I talked to our instructor and she marked this week's work with a colored pencil thing so we can tell them apart. I also made a note of what I made and what colors I used so I could tell which are mine more easily. I think it's also a good idea that we show up on time or even early next week. So this week we actually got to blow glass. We did it in teams where one would blow while the other turned the blow pipe so I wasn't able to get any pics of that. I suppose I could have asked someone to take our picture but I didn't. We made a few clear balls and then a colored ornament one. We found this week was much easier than last week. Maybe taking a week to let everything soak in and think about what we could do better helped. 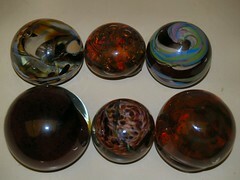 Below is a pic of the paperweights we made last week. Click on it to see the other glassblowing pics Doug and I took. Cool pix! How come you're wearing dark glasses and Doug isn't? Cuz Doug's a bad boy! Will be looking forward to the pix from week 2.